Original content helped deal aggregating website DealNews attract readers during last year's fourth-quarter shopping season. Original content helped deal aggregating website DealNews attract readers during last year’s fourth-quarter shopping season. "We’re always looking for ways to attract new and existing readers to the site," explains PR manager Mark LoCastro. "The fourth quarter is extremely busy in terms of holiday shopping coverage, so we want to get the message out that we're here to help people save time and money when they shop." Original content was driven through social media channels, media and blogger relations, email communications, and the website. "We’ve been around for 17 years so the story of what we do isn’t news," LoCastro says. "But leveraging our 17 years worth of pricing and shopping data is popular with media because it helps tell trend stories. Creating original content around our data inserts DealNews into the shopping conversation." Created content included buying guides, shopping tips, top 10 lists, deal and price predictions, and industry forecasts. Each piece was pitched to appropriate journalists and bloggers covering personal finance, general consumer interest, electronics and technology, shopping, and retail. Five to six pieces of original content were posted daily between October 1 and December 31 to the "Features" section of the website and Twitter. Select content was posted to Facebook. Content also went out in newsletters to email subscribers, who were offered an opportunity to enter two sweepstakes to win an iPad. 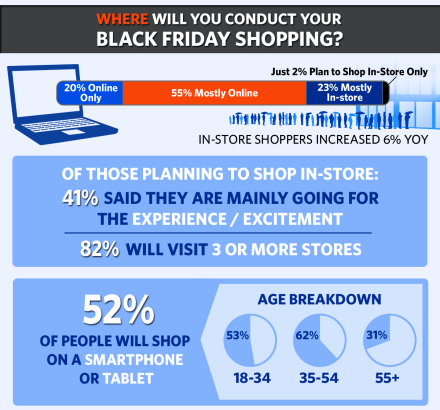 Readers were surveyed on the website in late October about Black Friday shopping and spending plans. A custom infographic illustrating results was pitched to journalists and bloggers and posted to the website, Flickr, Pinterest, Facebook, Twitter, and Google+. LoCastro answered consumer questions about getting the best Black Friday deals during a November 18 live online chat hosted on LifeHacker.com. DealNews spokespeople also participated in a five-part video series covering top Cyber Monday deals on Yahoo.com. Between October 1 and December 31 website visits were up 28% and page views were up 47% compared to third quarter 2013. Quarter-over-quarter social media gains included a 133% increase in Facebook likes; a 16% increase in referral visits from Facebook; a 155% increase in Twitter followers; and a 32% increase in referral visits from Twitter. Revenue generated from email response increased 85% year-over-year. The two sweepstakes garnered 140,000 entries. Similar sweepstakes earlier in 2013 drew 40,000 to 70,000 entries each. Nearly 3,000 earned stories ran in outlets including USA Today, Huffington Post, DailyFinance, and CNBC. Nearly 890 earned online media placements resulted in 787,519 referral visits to the website, up 42% year-over-year and beating the goal of 720,000. More than 2,000 earned TV placements delivered 60.6 million viewers, up 370% quarter-over-quarter and well beyond the goal of 20.5 million viewers. LoCastro notes the campaign delivered "the best numbers in terms of PR in DealNews’ history." LoCastro and his team continue to develop original content including items about monitoring trends and educating consumers about when to shop for items in various categories.